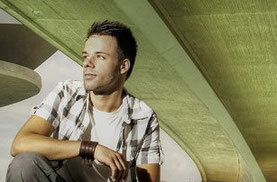 Spanish producer Bolumar drops the ʻPressurizedʼ EP on Northern England based Luna Records. Previous releases on Kling Klong and Session Deluxe have seen Bolumar earn support from the likes of Slam, DJ T, Moodymanc, Martin Eyerer, Edu Imbernon and Coyu. ʻDown Lowʼ kicks off the EP with a stripped back swinging drum arrangement and low-end electric piano tones. Simplicity appears to be key here with low pitch vocals creeping in alongside a bouncy bass line for a steady near eight minutes. Title track ʻPressurizedʼ has an air of Chicago houseʼs early days, the constant synth stab drives the track while the use of a double kick drum at the end of each bar and short sub hits gives it a bumpy dance floor feel. ʻEven Moreʼ is a slice of evocative deep house, the prominent drum pattern being the main focus point is enhanced by submerged melodies and the clever use of subtle reverb and delays. The indecipherable vocal chops slip tightly amongst the groove adding to its movement. 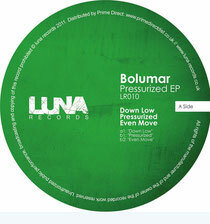 Bolumarʼs ʻPressurizedʼ EP is released on 8th February 2012 on Luna Records, with a digital release to follow.